Thank you to Kirkwood resident Fred Ortlip for sending us this great photo of Walker Lake, in Kirkwood Park, at sunset. You can walk on the overlook deck in Greentree Park to view the new prairie and wetlands area. Not a cloud in the sky on the picture-perfect day this one was taken. Officer Anthony "TJ" Stemmler demonstrates bike safety to eager "Bike Rodeo" participants. L to R: Nancy Luetzow, Mark Zimmer, Deb Lavender, David Slane, Tim Griffin, Maggie Duwe, Kara Wurtz, Ellen Edman, and Cory Meyer (2018 tree planting). Diversity is the variety of human differences. Inclusion is valuing and respecting those differences. Equity is the equality of opportunity that comes with true inclusion. 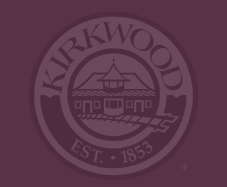 In Kirkwood we believe that through diversity we will excel; through inclusion we will draw each person into our circle of community; and focused on equity for all we will serve each person. Our citizens are respected based on individual strengths regardless of race, ethnicity, gender, gender identity, religion, age, sexual orientation, disability, life experience, geographic background, skills or talents, and other valued differences. We strive to ensure that all who are present in this building feel safe, welcome, and respected. We desire that our embrace of diversity, inclusion and equity be entended throughout our community and beyond. Help fight crime in your neighborhood - register today for the Community Camera Program. An informed caller is 9-1-1's best caller. Learn More about how to help 9-1-1 dispatchers help you. Despite a difficult winter, some progress has been made on construction. Does Your Water Taste or Smell Odd? Your water is safe to drink. Click on "Learn More" for more information.